OPC Unified Architecture, or OPC UA, is the latest standard from the OPC Foundation, with improvements over OPC Classic in the areas of data security, networking, and platform independence. The Cogent DataHub can act as both an OPC UA server and client program at the same time. This means it can read from multiple OPC UA servers (while acting as a client), and make this data available to any number of OPC UA client programs (while acting as a server). This OPC UA server and client support is fully integrated with all other DataHub features. You can use the DataHub to convert between OPC UA and OPC DA, connect OPC UA to any SQL database, display and access OPC UA data via WebView, connect to Modbus or Excel, send emails, or support tunnelling OPC, server-to-server bridging, data aggregation, redundancy, and more. Connect any number of OPC UA servers or clients. 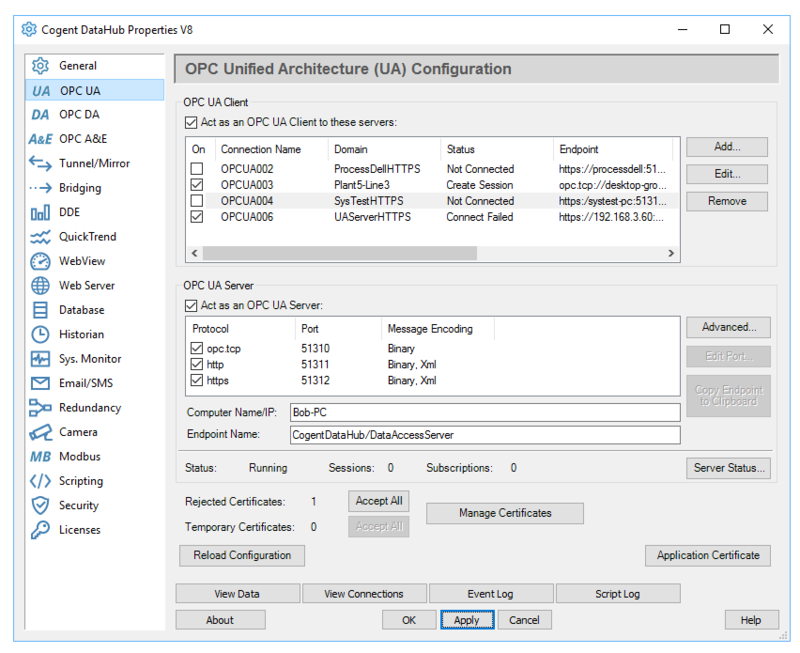 Convert OPC UA to OPC DA, acting as a gateway. Connect OPC UA servers to any SQL database. Display data from OPC UA in a web-based HMI. Connect OPC UA to Modbus slaves or Excel spreadsheets. Send emails based on data from OPC UA.